Ms. J Mentions...: Sunday Short Report! I purchased this book and chose to do an honest and unbiased review. Daniel Parsons and Octavo Publishing neither requested nor are associated with this review. 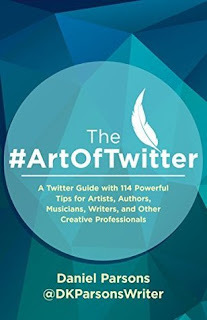 In The #ArtOfTwitter, fantasy writer and Twitter coach Daniel Parsons explains how he grew a 90,000 strong army of loyal followers and gained real-world influence as an indie author. Breaking his tactics into short chapters and simple, actionable steps, he demonstrates exactly how any creative professional can achieve similar results. Before reading this book, I was intimidated by Twitter. It was so foreign! I had no idea how to talk to people and if it was OK to talk to people I never met. I know that sounds strange, but I am more of the "network in real life" kind of person. A part of me will always worry that the connections I form over the internet are just people trying to be nice. Parsons, however has completely convinced me to change the way that I see Twitter. The techniques that he shared in this book helped me to feel more comfortable on this website, drive more traffic to my blog, and drive a larger audience to my Etsy page! 1. Parsons makes it so easy for any noob to follow. He even takes those extra moments to tell us what the terms mean and he reminds us what they mean again later! 2. Each chapter ends in a recap. I used this so many times to go back and make sure that I understood every point in the chapter. 3. Parsons includes a section on how to grow a following. After using the steps that he shows in his book, my Twitter following doubled in three weeks. I went from 114 followers to 237! Even if you feel like you totally understand Twitter, I would suggest reading this book to see how else Twitter can help you!